Chef Brian Roland hopes his latest creation, a customizable event space, will become the ultimate venue in Naples. Venue Naples is a blank canvas for the local celebrity chef, who soon will have permanent kitchen space for his Crave Culinaire catering company’s “restaurant without walls” while cooking up a new, multi-use destination for everything from hors d’oeuvres at private galas to four-course, public pop-up dinners. 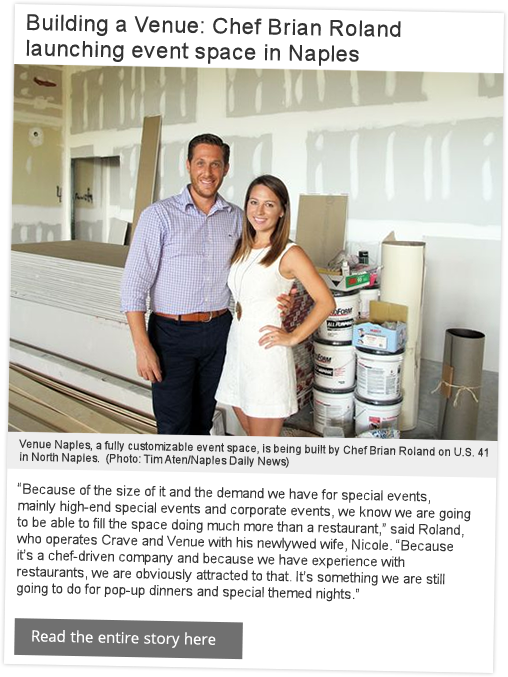 In January, Venue Naples is targeted to launch in Royal Cove Plaza, 13240 U.S. 41 N., south of Wiggins Pass Road in North Naples. The large wall was removed between what had separated the dining area from the bar at the former Manzanillo’s Cocina Mexicana restaurant, the same wall that had divided EVOO Market & Bistro, previous tenants in the 8,000-square-foot commercial space.